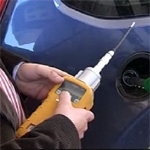 Sensotran are the industrial partner in the nano2hybrids project. A small family firm based just outside Barcelona in Spain, they are experts in commercial production of gas sensors for a range of industries, notably for detecting dangerous gases produced in the petrochemical industry, and detectable in low concentrations at petrol stations. It is the goal of the project to produce a new nanotube-based sensor that will allow ultra-sensitive and rapid detection of gases in these environments - and preferably a cheap sensor too!